The first Quarterly Medal for 2011 was held at the Club yesterday, Sat 26th February. The morning medals were closely contested, with Julian Metzner just edging out Michael MacAleavey with a superior win ratio of only 0.3%, and John Moran also securing his medal with a superior win ratio. The afternoon saw Isabelle Carr street the field and win all of her pool matches, whilst Greg Moran, the father of one of the morning winners, was successful in his group. Julian, John, Isabelle and Greg have all now qualified to compete in the Medal of Medallists competition on Finals Day in December. The first event of the RMTC’s regular season for 2011, the 100 and Overs Tournament, was played today by ten pairs, none of whom lived up to the event’s reputation for catering to the old and cantankerous. Everyone seemed to be playing well with no particular team proving dominant. Each of the semi-finalists had tasted defeat during the round robin stage with two of the teams having 2/2 (win/loss) records – so things were tight. Through to the semi-finals were Sophie Johnson and Peter Fenwick who were pitted against Greg Moran and Steve Wood, and Russell Middleton and Greg Reid who played Brigitte Claney and Charles Wright. The final was played in good humour as well as with plenty of skill. 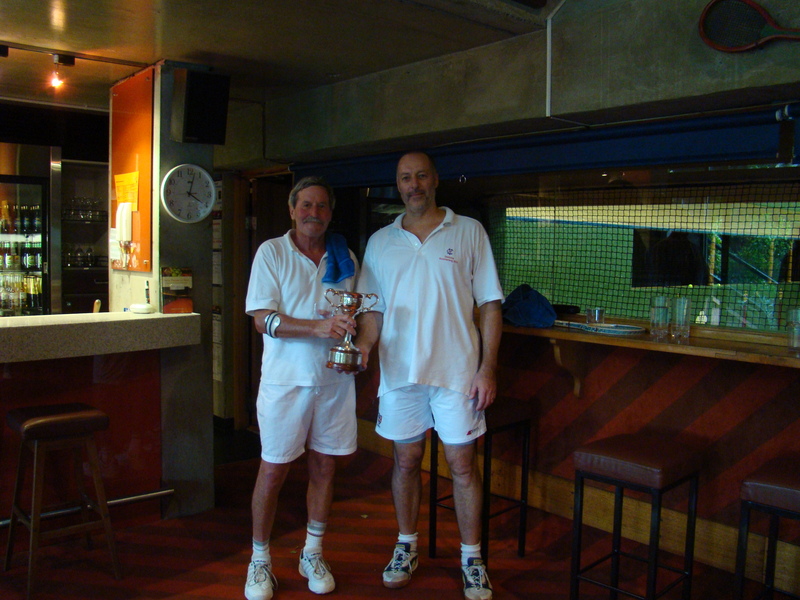 Greg, who won a club event late last year and Steve who is usually there-about in these handicap doubles events, both played well. At one stage Steve served the perfect Cannonball to protect a chase. On another occasion Steve’s Cannonball slammed straight into the Bandeau before ricocheting off narrowly missing Russell. Russell’s partner Greg is a big man and was able to provide ample coverage for Russell to hide behind during later points. Regardless, Steve’s aggressive and effective serving was not enough. Greg is a fast improving player with a natural volley and Russell was clearly man-of-the-match. During the final Russell successfully played volley returns to half a yard as well as a superb smash volley to protect the Dedan which went for a winner just below the Winning Gallery. Congratulations Russell and Greg on your first tournament wins at the RMTC and well done to everyone to everyone else for making it a fun day. Wednesday’s semi finals were both well contested. In the first semi Frank Filippelli and Kieren Booth both took the battle up to the reigning champions Fahey and Virgona. Frank was the oldest player on court but his combination of pride and athleticism allowed Kieren enough chances to showcase his improving game. Kieren’s volleys off the main wall and execution at the net was excellent and many said it was his best game. To date this has been the best performance against Fahey and Virgona in either the Open or the Championship. Never-the-less Rob and Steve still showed themselves to be the most formidable doubles pairing the game has seen to date. The second semi was much closer. Ben Matthews and Julian Snow were aiming to make their second doubles final in a week when they took on Ruaraidh Gunn and Chris Chapman who had looked so good yesterday. Matthews and Snow were the first to settle and they took the first two sets with apparent ease as the tempo of the match appeared to suit them. Only in the third set did Ruaraidh and Chris start to find their feet as they upped the pace of the game, Chris Chapman in particular played a number of magnificent forces. The fourth set was close but an extra effort from the tiring Snow combined with Ben’s impenetrable defence at both the net and under the Grille saw them home. Today saw the four quarter finals of the Men’s World Tennis Doubles Championship played. All matches went to script with the possible exception being that the AUS amateur champion pairing of Mike Happell and Bret Richardson got beaten by Ruaraidh Gunn and Chris Chapman. The form of Gunn and Chapman looked ominous today so tomorrow night’s match should be a beauty. Remember to sign up for the first four sets of the Final for this Friday night February 4.